"10 Best Books of 2007"
"2007 Books We Liked the Best"
"Iowa Reader Literary Award for Non-Fiction for 2007"
"Kalish's memoir of her Iowa childhood, set against the backdrop of the Depression, captures a vanished way of traditional living and a specific moment in American history in a story both illuminating and memorable. Kalish lived with her siblings, mother and grandparents-seven in all-both in a town home and, in warmer weather, out on a farm. The lifestyle was frugal in the extreme: "The only things my grandparents spent money on were tea, coffee, sugar, salt, white flour, cloth and kerosene." But in spite of the austere conditions, Kalish's memories are mostly happy ones: keeping the farm and home going, caring for animals, cooking elaborate multi-course meals and washing the large family's laundry once a week, by hand. Here, too, are stories of gossiping in the kitchen, digging a hole to China with the "Big Kids" and making head cheese at butchering time. Kalish skillfully rises above bitterness and sentiment, giving her memoir a clear-eyed narrative voice that puts to fine use a lifetime of careful observation: "Observing the abundance of life around us was just so naturally a part of our days on the farm that it became a habit." Simple, detailed and honest, this is a refreshing and informative read for anyone interested in the struggles of average Americans in the thick of the Great Depression." "Little Heathens is an enchanting but thoroughly unsentimental look at rural life in the Great Depression. In clear clean prose we are offered the grit, struggle, and also the joy of hard work on a farm. I cherish this book for its quite naked honesty and quiet lyricism about a time which makes our current problems nearly childish. This is a fine book." "This lovely book, so unaffected and so generous, opens the door to a past I knew as a child in Iowa, and I wept with joy and recognition as I read it. It deserves a distinguished place next to Hamlin Garland's Son of the Middle Border but, with its deep humility, it would also fit, without a single word of protest, next to the Betty Crocker Cookbook." "Using this book alone, one could reconstruct, with glorious exactness, a lost time and place. Mildred Kalish has a novelist's eye for detail and a beautiful understanding of what the gestures of daily life mean. A lovely, wise, transporting memoir." "Now that cell phones are a way of life, you won’t find a better way to participate in the Good Old Days. Whether you are of farm origins or not, Little Heathens is a bit of history begging to be borrowed. Like a neighborly cup of sugar, it will sweeten your modern-day life." "I have always loved to listen to people's stories of growing up in a different time and place than mine. My grandparents and many of my bookstore customers have shared wonderful tales of growing up during the Depression in the Midwest. It is no surprise that I find Little Heathens a charming collection of memories. Winters with her siblings under the strict guidance of their grandparents and summers on the farm with their single mother provide Mildred Kalish with a unique trove of information about a history many of us have in common. It's like sitting out on the back porch eating pie listening to stories your relatives are sharing. Readable comfort food." "This unpretentious yet deeply intelligent memoir of growing up on a central Iowa farm in the throes of the Great Depression radiates the joy of a vanished way of life as Kalish recounts what appear to contemporary eyes as unendurable deprivations. Those who share Kalish's Midwestern farm background will immediately identify with her recollections of winter nights spent under layers of quilts in unheated bedrooms. Others for whom agrarian life is uncharted territory will learn both the harsh rigors of days governed by unforgiving work cycles and the irreproducible sensual pleasure of savoring a just-picked, sun-drenched, ripe strawberry or tomato. In prose that never yields to mawkish sentimentality, Kalish details the roles of family, religion, thrift, and education in her upbringing. The complexities of wash-day chores will bring up short those who know only today's appliances. Kalish's disquisition on outhouse etiquette will simply amaze those accustomed to their own bathrooms. This will offer the iPod generation an entertaining and informative view of rural American life before World War II." "Kalish's writing style is very straight-forward and simple, so it really does seem like your grandma is sitting there and talking to you about all of these recipes and memories. And feeding you all those goodies at the same time, of course." "The setting of this book is near Garrison Iowa. Mildred explains that she lived in a small two story farm house." On Thursday, February 28, The Today Show on NBC launched a new monthly segment called "Cover to Cover" featuring owners of independent bookstores and their book recommendations. In the first segment, Little Heathens was recommended by a bookseller in Elliot Bay, Washington (near Seattle). On Thursday, February 19, CBS News featured Millie Kalish. "At 86, Millie Kalish is an expert on surviving rough patches in the economy. 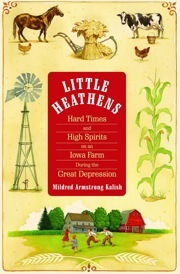 Her best-selling memoir, "Little Heathens", details her life growing up on an Iowa farm during the Great Depression. Little Heathens is published by Bantam Dell, a division of Random House, Inc.